You will never get bored with me! Igrobook is a standalone device that can be connected to the Internet via Wi-Fi or a 3G modem. Igrobook may be a laptop, tablet, telephone, as well as the usual desktop computer. - Access at any place on earth where there is a WI FI zone! - Your favorite games are always with you! - Instant and free money transfers to the accounts of gaming systems. - Individual approach to each client, the possibility to choose manufacturer, model and design of the laptop. - Technical support round the clock, assistance of call-center experts. - The shortest terms of manufacturing. Access to the best entertainment services is at your disposal 24 hours a day, 365 days a year! 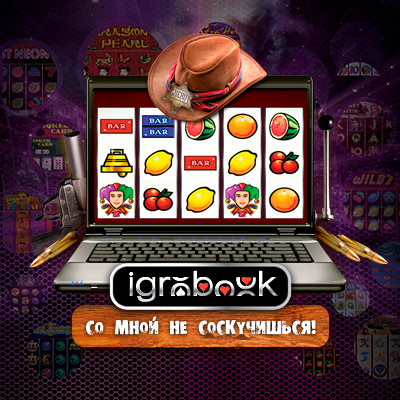 Igrobook gives you the opportunity to enjoy an exciting game, in any place convenient for you. Game systems are the most popular games for video slots, from the classic multifruit games to games with 3D graphics and dazzling special effects! A wide range of card games, roulette, poker, craps, games with interactive dealer! All games provide excellent image quality, rich sound, vibrant graphics, high-speed downloads, the unconventional math. The possibility to play real casino online is at your disposal.